1 A None No Power Seat 1 A is a standard Business Class Bulkhead seat. There is no floor storage for this seat during take-off and landing. 1 C None No Power Seat 1 C is a standard Business Class Bulkhead seat. There is no floor storage for this seat during take-off and landing. 1 D None No Power Seat 1 D is a standard Business Class Bulkhead seat. There is no floor storage for this seat during take-off and landing. 1 E None No Power Seat 1 E is a standard Business Class Bulkhead seat. There is no floor storage for this seat during take-off and landing. 1 F None No Power Seat 1 F is a standard Business Class Bulkhead seat. There is no floor storage for this seat during take-off and landing. 1 H None No Power Seat 1 H is a standard Business Class Bulkhead seat. There is no floor storage for this seat during take-off and landing. 1 K None No Power Seat 1 K is a standard Business Class Bulkhead seat. There is no floor storage for this seat during take-off and landing. 10 A None No Power Seat 10 A is designated by Scoot as a "SuperSeat." This seat is also is located in the "ScootinSilence" cabin, which is quieter than other areas on this aircraft. Scoot charges an extra fee to reserve this seat. 10 B None No Power Seat 10 B is designated by Scoot as a "SuperSeat." This seat is also is located in the "ScootinSilence" cabin, which is quieter than other areas on this aircraft. Scoot charges an extra fee to reserve this seat. 10 C None No Power Seat 10 C is designated by Scoot as a "SuperSeat." This seat is also is located in the "ScootinSilence" cabin, which is quieter than other areas on this aircraft. Scoot charges an extra fee to reserve this seat. 10 D None No Power Seat 10 D is designated by Scoot as a "SuperSeat." This seat is also is located in the "ScootinSilence" cabin, which is quieter than other areas on this aircraft. Scoot charges an extra fee to reserve this seat. 10 E None No Power Seat 10 E is designated by Scoot as a "SuperSeat." This seat is also is located in the "ScootinSilence" cabin, which is quieter than other areas on this aircraft. Scoot charges an extra fee to reserve this seat. 10 F None No Power Seat 10 F is designated by Scoot as a "SuperSeat." This seat is also is located in the "ScootinSilence" cabin, which is quieter than other areas on this aircraft. Scoot charges an extra fee to reserve this seat. 10 H None No Power Seat 10 H is designated by Scoot as a "SuperSeat." This seat is also is located in the "ScootinSilence" cabin, which is quieter than other areas on this aircraft. Scoot charges an extra fee to reserve this seat. 10 J None No Power Seat 10 J is designated by Scoot as a "SuperSeat." This seat is also is located in the "ScootinSilence" cabin, which is quieter than other areas on this aircraft. Scoot charges an extra fee to reserve this seat. 10 K None No Power Seat 10 K is designated by Scoot as a "SuperSeat." This seat is also is located in the "ScootinSilence" cabin, which is quieter than other areas on this aircraft. Scoot charges an extra fee to reserve this seat. 11 A None No Power Seat 11 A is a bulkhead seat designated by Scoot as a "S-t-r-e-t-c-h Seat" with extra legroom. Scoot charges an extra fee to reserve this seat. The close proximity to the galley may be bothersome. The tray table is in the armrest, making the armrest immovable and slightly reducing seat width. There is no floor storage for this seat during take-off and landing. 11 B None No Power Seat 11 B is a bulkhead seat designated by Scoot as a "S-t-r-e-t-c-h Seat" with extra legroom. Scoot charges an extra fee to reserve this seat. The close proximity to the galley may be bothersome. The tray table is in the armrest, making the armrest immovable and slightly reducing seat width. There is no floor storage for this seat during take-off and landing. 11 C None No Power Seat 11 C is a bulkhead seat designated by Scoot as a "S-t-r-e-t-c-h Seat" with extra legroom. Scoot charges an extra fee to reserve this seat. The close proximity to the galley may be bothersome. The tray table is in the armrest, making the armrest immovable and slightly reducing seat width. There is no floor storage for this seat during take-off and landing. 11 D None No Power Seat 11 D is a bulkhead seat designated by Scoot as a "S-t-r-e-t-c-h Seat" with extra legroom. Scoot charges an extra fee to reserve this seat. The close proximity to the galley may be bothersome. The tray table is in the armrest, making the armrest immovable and slightly reducing seat width. There is no floor storage for this seat during take-off and landing. 11 E None No Power Seat 11 E is a bulkhead seat designated by Scoot as a "S-t-r-e-t-c-h Seat" with extra legroom. Scoot charges an extra fee to reserve this seat. The close proximity to the galley may be bothersome. The tray table is in the armrest, making the armrest immovable and slightly reducing seat width. There is no floor storage for this seat during take-off and landing. 11 F None No Power Seat 11 F is a bulkhead seat designated by Scoot as a "S-t-r-e-t-c-h Seat" with extra legroom. Scoot charges an extra fee to reserve this seat. The close proximity to the galley may be bothersome. The tray table is in the armrest, making the armrest immovable and slightly reducing seat width. There is no floor storage for this seat during take-off and landing. 11 H None No Power Seat 11 H is a bulkhead seat designated by Scoot as a "S-t-r-e-t-c-h Seat" with extra legroom. Scoot charges an extra fee to reserve this seat. The close proximity to the galley may be bothersome. The tray table is in the armrest, making the armrest immovable and slightly reducing seat width. There is no floor storage for this seat during take-off and landing. 11 J None No Power Seat 11 J is a bulkhead seat designated by Scoot as a "S-t-r-e-t-c-h Seat" with extra legroom. Scoot charges an extra fee to reserve this seat. The close proximity to the galley may be bothersome. The tray table is in the armrest, making the armrest immovable and slightly reducing seat width. There is no floor storage for this seat during take-off and landing. 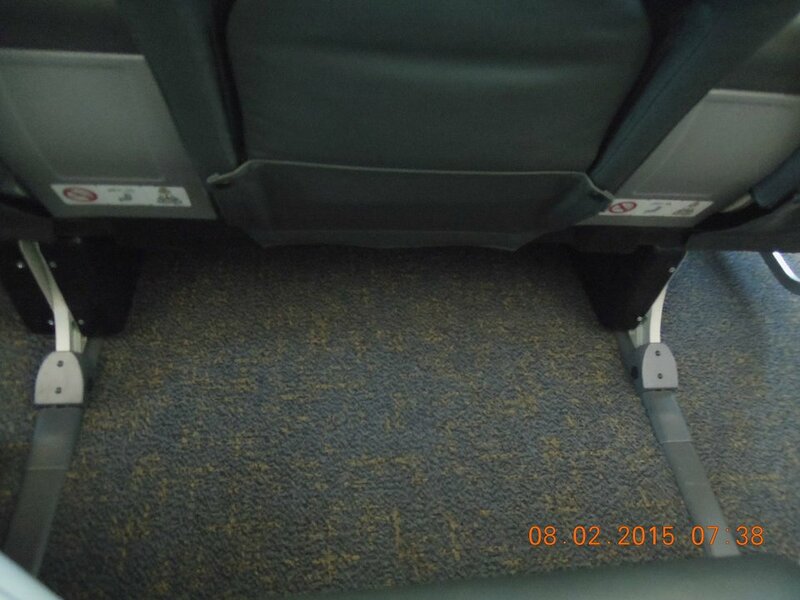 11 K None No Power Seat 11 K is a bulkhead seat designated by Scoot as a "S-t-r-e-t-c-h Seat" with extra legroom. Scoot charges an extra fee to reserve this seat. The close proximity to the galley may be bothersome. The tray table is in the armrest, making the armrest immovable and slightly reducing seat width. There is no floor storage for this seat during take-off and landing. 12 D None No Power Seat 12 D is designated by Scoot as a "SuperSeat". Scoot charges an extra fee to reserve this seat. 12 E None No Power Seat 12 E is designated by Scoot as a "SuperSeat". Scoot charges an extra fee to reserve this seat. 12 F None No Power Seat 12 F is designated by Scoot as a "SuperSeat". Scoot charges an extra fee to reserve this seat. 13 D None No Power Seat 13 D is designated by Scoot as a "SuperSeat". Scoot charges an extra fee to reserve this seat. 13 E None No Power Seat 13 E is designated by Scoot as a "SuperSeat". Scoot charges an extra fee to reserve this seat. 13 F None No Power Seat 13 F is designated by Scoot as a "SuperSeat". Scoot charges an extra fee to reserve this seat. 14 D None No Power Seat 14 D is designated by Scoot as a "SuperSeat". Scoot charges an extra fee to reserve this seat. 14 E None No Power Seat 14 E is designated by Scoot as a "SuperSeat". Scoot charges an extra fee to reserve this seat. 14 F None No Power Seat 14 F is designated by Scoot as a "SuperSeat". Scoot charges an extra fee to reserve this seat. 28 C None No Power Seat 28 C is a standard Economy Class seat however, the close proximity to the lavatories may be bothersome. 28 D None No Power Seat 28 D is a standard Economy Class seat however, the close proximity to the lavatories may be bothersome. 28 E None No Power Seat 28 E is a standard Economy Class seat however, the close proximity to the lavatories may be bothersome. 28 F None No Power Seat 28 F is a standard Economy Class seat however, the close proximity to the lavatories may be bothersome. 28 H None No Power Seat 28 H is a standard Economy Class seat however, the close proximity to the lavatories may be bothersome. 28 J None No Power Seat 28 J is a standard Economy Class seat however, the close proximity to the lavatories may be bothersome. 28 K None No Power Seat 28 K is a standard Economy Class seat however, the close proximity to the lavatories may be bothersome. 29 A None No Power Seat 29 A is a standard Economy Class seat that is missing a window. The close proximity to the lavatories may be bothersome. 29 B None No Power Seat 29 B is a standard Economy Class seat however, the close proximity to the lavatories may be bothersome. 29 C None No Power Seat 29 C is a standard Economy Class seat however, the close proximity to the lavatories may be bothersome. 30 D None No Power Seat 30 D is an Exit Row seat designated by Scoot as a "S-t-r-e-t-c-h Seat" with extra legroom. Scoot charges an extra fee to reserve this seat. The close proximity to the lavatories may be bothersome. The tray table is in the armrest, making the armrest immovable and slightly reducing seat width. There is no floor storage for this seat during take-off and landing. 30 E None No Power Seat 30 E is an Exit Row seat designated by Scoot as a "S-t-r-e-t-c-h Seat" with extra legroom. Scoot charges an extra fee to reserve this seat. The close proximity to the lavatories may be bothersome. The tray table is in the armrest, making the armrest immovable and slightly reducing seat width. There is no floor storage for this seat during take-off and landing. 30 F None No Power Seat 30 F is an Exit Row seat designated by Scoot as a "S-t-r-e-t-c-h Seat" with extra legroom. Scoot charges an extra fee to reserve this seat. The close proximity to the lavatories may be bothersome. The tray table is in the armrest, making the armrest immovable and slightly reducing seat width. There is no floor storage for this seat during take-off and landing. 31 A None No Power Seat 31 A is an Exit Row seat designated by Scoot as a "S-t-r-e-t-c-h Seat" with extra legroom. Scoot charges an extra fee to reserve this seat. The close proximity to the lavatories may be bothersome. The tray table is in the armrest, making the armrest immovable and slightly reducing seat width. There is no floor storage for this seat during take-off and landing. 31 B None No Power Seat 31 B is an Exit Row seat designated by Scoot as a "S-t-r-e-t-c-h Seat" with extra legroom. Scoot charges an extra fee to reserve this seat. The close proximity to the lavatories may be bothersome. The tray table is in the armrest, making the armrest immovable and slightly reducing seat width. There is no floor storage for this seat during take-off and landing. 31 C None No Power Seat 31 C is an Exit Row seat designated by Scoot as a "S-t-r-e-t-c-h Seat" with extra legroom. Scoot charges an extra fee to reserve this seat. The close proximity to the lavatories may be bothersome. The tray table is in the armrest, making the armrest immovable and slightly reducing seat width. There is no floor storage for this seat during take-off and landing. 31 H None No Power Seat 31 H is an Exit Row seat designated by Scoot as a "S-t-r-e-t-c-h Seat" with extra legroom. Scoot charges an extra fee to reserve this seat. The close proximity to the lavatories may be bothersome. The tray table is in the armrest, making the armrest immovable and slightly reducing seat width. There is no floor storage for this seat during take-off and landing. 31 J None No Power Seat 31 J is an Exit Row seat designated by Scoot as a "S-t-r-e-t-c-h Seat" with extra legroom. Scoot charges an extra fee to reserve this seat. The close proximity to the lavatories may be bothersome. The tray table is in the armrest, making the armrest immovable and slightly reducing seat width. There is no floor storage for this seat during take-off and landing. 31 K None No Power Seat 31 K is an Exit Row seat designated by Scoot as a "S-t-r-e-t-c-h Seat" with extra legroom. Scoot charges an extra fee to reserve this seat. The close proximity to the lavatories may be bothersome. The tray table is in the armrest, making the armrest immovable and slightly reducing seat width. There is no floor storage for this seat during take-off and landing. 32 A None No Power Seat 32 A is designated by Scoot as a "SuperSeat". Scoot charges an extra fee to reserve this seat. 32 B None No Power Seat 32 B is designated by Scoot as a "SuperSeat". Scoot charges an extra fee to reserve this seat. 32 C None No Power Seat 32 C is designated by Scoot as a "SuperSeat". Scoot charges an extra fee to reserve this seat. 32 H None No Power Seat 32 H is designated by Scoot as a "SuperSeat". Scoot charges an extra fee to reserve this seat. 32 J None No Power Seat 32 J is designated by Scoot as a "SuperSeat". Scoot charges an extra fee to reserve this seat. 32 K None No Power Seat 32 K is designated by Scoot as a "SuperSeat". Scoot charges an extra fee to reserve this seat. 33 A None No Power Seat 33 A is designated by Scoot as a "SuperSeat". Scoot charges an extra fee to reserve this seat. 33 B None No Power Seat 33 B is designated by Scoot as a "SuperSeat". Scoot charges an extra fee to reserve this seat. 33 C None No Power Seat 33 C is designated by Scoot as a "SuperSeat". Scoot charges an extra fee to reserve this seat. 33 H None No Power Seat 33 H is designated by Scoot as a "SuperSeat". Scoot charges an extra fee to reserve this seat. 33 J None No Power Seat 33 J is designated by Scoot as a "SuperSeat". Scoot charges an extra fee to reserve this seat. 33 K None No Power Seat 33 K is designated by Scoot as a "SuperSeat". Scoot charges an extra fee to reserve this seat. 42 A None No Power Seat 42 A is a standard Economy Class seat that is missing a window. 42 K None No Power Seat 42 K is a standard Economy Class seat that is missing a window. 44 A None No Power Seat 44 A is designated by Scoot as a "SuperSeat." Scoot charges an extra fee to reserve this seat. This seat may not recline. However, it has more space as there is no middle seat. Couples often prefer traveling in this row as it is one of the only twosomes on the aircraft. The close proximity to the lavatories may be bothersome. 44 C None No Power Seat 44 C is designated by Scoot as a "SuperSeat." Scoot charges an extra fee to reserve this seat. This seat may not recline. However, it has more space as there is no middle seat. Couples often prefer traveling in this row as it is one of the only twosomes on the aircraft. The close proximity to the lavatories may be bothersome. 44 D None No Power Seat 44 D is a standard Economy Class seat however, the proximity to the lavatories may be bothersome. 44 F None No Power Seat 44 F is a standard Economy Class seat however, the proximity to the lavatories may be bothersome. 44 H None No Power Seat 44 H is designated by Scoot as a "SuperSeat." Scoot charges an extra fee to reserve this seat. This seat may not recline. However, it has more space as there is no middle seat. Couples often prefer traveling in this row as it is one of the only twosomes on the aircraft. The close proximity to the lavatories may be bothersome. 44 K None No Power Seat 44 K is designated by Scoot as a "SuperSeat." Scoot charges an extra fee to reserve this seat. This seat may not recline. However, it has more space as there is no middle seat. Couples often prefer traveling in this row as it is one of the only twosomes on the aircraft. The close proximity to the lavatories may be bothersome. 45 D None No Power Seat 45 D is an Economy Class seat in the last row of the plane that may have limited recline. The close proximity to the lavatories and galley may be bothersome. 45 E None No Power Seat 45 E is an Economy Class seat in the last row of the plane that may have limited recline. The close proximity to the lavatories and galley may be bothersome. 45 F None No Power Seat 45 F is an Economy Class seat in the last row of the plane that may have limited recline. The close proximity to the lavatories and galley may be bothersome. 6 A None No Power Seat 6 A is a bulkhead seat designated by Scoot as a "S-t-r-e-t-c-h Seat" with extra legroom. This seat is also is located in the "ScootinSilence" cabin, which is quieter than other areas on this aircraft. Scoot charges an extra fee to reserve this seat. The tray table is in the armrest, making the armrest immovable and slightly reducing seat width. There is no floor storage for this seat during take-off and landing. 6 B None No Power Seat 6 B is a bulkhead seat designated by Scoot as a "S-t-r-e-t-c-h Seat" with extra legroom. This seat is also is located in the "ScootinSilence" cabin, which is quieter than other areas on this aircraft. Scoot charges an extra fee to reserve this seat. The tray table is in the armrest, making the armrest immovable and slightly reducing seat width. There is no floor storage for this seat during take-off and landing. 6 C None No Power Seat 6 C is a bulkhead seat designated by Scoot as a "S-t-r-e-t-c-h Seat" with extra legroom. This seat is also is located in the "ScootinSilence" cabin, which is quieter than other areas on this aircraft. Scoot charges an extra fee to reserve this seat. The tray table is in the armrest, making the armrest immovable and slightly reducing seat width. There is no floor storage for this seat during take-off and landing. 6 D None No Power Seat 6 D is a bulkhead seat designated by Scoot as a "S-t-r-e-t-c-h Seat" with extra legroom. This seat is also is located in the "ScootinSilence" cabin, which is quieter than other areas on this aircraft. Scoot charges an extra fee to reserve this seat. The tray table is in the armrest, making the armrest immovable and slightly reducing seat width. There is no floor storage for this seat during take-off and landing. 6 E None No Power Seat 6 E is a bulkhead seat designated by Scoot as a "S-t-r-e-t-c-h Seat" with extra legroom. This seat is also is located in the "ScootinSilence" cabin, which is quieter than other areas on this aircraft. Scoot charges an extra fee to reserve this seat. The tray table is in the armrest, making the armrest immovable and slightly reducing seat width. There is no floor storage for this seat during take-off and landing. 6 F None No Power Seat 6 F is a bulkhead seat designated by Scoot as a "S-t-r-e-t-c-h Seat" with extra legroom. This seat is also is located in the "ScootinSilence" cabin, which is quieter than other areas on this aircraft. Scoot charges an extra fee to reserve this seat. The tray table is in the armrest, making the armrest immovable and slightly reducing seat width. There is no floor storage for this seat during take-off and landing. 6 H None No Power Seat 6 H is a bulkhead seat designated by Scoot as a "S-t-r-e-t-c-h Seat" with extra legroom. This seat is also is located in the "ScootinSilence" cabin, which is quieter than other areas on this aircraft. Scoot charges an extra fee to reserve this seat. The tray table is in the armrest, making the armrest immovable and slightly reducing seat width. There is no floor storage for this seat during take-off and landing. 6 J None No Power Seat 6 J is a bulkhead seat designated by Scoot as a "S-t-r-e-t-c-h Seat" with extra legroom. This seat is also is located in the "ScootinSilence" cabin, which is quieter than other areas on this aircraft. Scoot charges an extra fee to reserve this seat. The tray table is in the armrest, making the armrest immovable and slightly reducing seat width. There is no floor storage for this seat during take-off and landing. 6 K None No Power Seat 6 K is a bulkhead seat designated by Scoot as a "S-t-r-e-t-c-h Seat" with extra legroom. This seat is also is located in the "ScootinSilence" cabin, which is quieter than other areas on this aircraft. Scoot charges an extra fee to reserve this seat. The tray table is in the armrest, making the armrest immovable and slightly reducing seat width. There is no floor storage for this seat during take-off and landing. 7 A None No Power Seat 7 A is designated by Scoot as a "SuperSeat." This seat is also is located in the "ScootinSilence" cabin, which is quieter than other areas on this aircraft. Scoot charges an extra fee to reserve this seat. 7 F None No Power Seat 7 F is designated by Scoot as a "SuperSeat." This seat is also is located in the "ScootinSilence" cabin, which is quieter than other areas on this aircraft. Scoot charges an extra fee to reserve this seat. 7 H None No Power Seat 7 H is designated by Scoot as a "SuperSeat." This seat is also is located in the "ScootinSilence" cabin, which is quieter than other areas on this aircraft. Scoot charges an extra fee to reserve this seat. 7 J None No Power Seat 7 J is designated by Scoot as a "SuperSeat." This seat is also is located in the "ScootinSilence" cabin, which is quieter than other areas on this aircraft. Scoot charges an extra fee to reserve this seat. 7 K None No Power Seat 7 K is designated by Scoot as a "SuperSeat." This seat is also is located in the "ScootinSilence" cabin, which is quieter than other areas on this aircraft. Scoot charges an extra fee to reserve this seat. 8 A None No Power Seat 8 A is designated by Scoot as a "SuperSeat." This seat is also is located in the "ScootinSilence" cabin, which is quieter than other areas on this aircraft. Scoot charges an extra fee to reserve this seat. 8 B None No Power Seat 8 B is designated by Scoot as a "SuperSeat." This seat is also is located in the "ScootinSilence" cabin, which is quieter than other areas on this aircraft. Scoot charges an extra fee to reserve this seat. 8 C None No Power Seat 8 C is designated by Scoot as a "SuperSeat." This seat is also is located in the "ScootinSilence" cabin, which is quieter than other areas on this aircraft. Scoot charges an extra fee to reserve this seat. 8 F None No Power Seat 8 F is designated by Scoot as a "SuperSeat." This seat is also is located in the "ScootinSilence" cabin, which is quieter than other areas on this aircraft. Scoot charges an extra fee to reserve this seat. 8 H None No Power Seat 8 H is designated by Scoot as a "SuperSeat." This seat is also is located in the "ScootinSilence" cabin, which is quieter than other areas on this aircraft. Scoot charges an extra fee to reserve this seat. 8 J None No Power Seat 8 J is designated by Scoot as a "SuperSeat." This seat is also is located in the "ScootinSilence" cabin, which is quieter than other areas on this aircraft. Scoot charges an extra fee to reserve this seat. 8 K None No Power Seat 8 K is designated by Scoot as a "SuperSeat." This seat is also is located in the "ScootinSilence" cabin, which is quieter than other areas on this aircraft. Scoot charges an extra fee to reserve this seat. 9 A None No Power Seat 9 A is designated by Scoot as a "SuperSeat." This seat is also is located in the "ScootinSilence" cabin, which is quieter than other areas on this aircraft. Scoot charges an extra fee to reserve this seat. 9 B None No Power Seat 9 B is designated by Scoot as a "SuperSeat." This seat is also is located in the "ScootinSilence" cabin, which is quieter than other areas on this aircraft. Scoot charges an extra fee to reserve this seat. 9 C None No Power Seat 9 C is designated by Scoot as a "SuperSeat." This seat is also is located in the "ScootinSilence" cabin, which is quieter than other areas on this aircraft. Scoot charges an extra fee to reserve this seat. 9 D None No Power Seat 9 D is designated by Scoot as a "SuperSeat." This seat is also is located in the "ScootinSilence" cabin, which is quieter than other areas on this aircraft. Scoot charges an extra fee to reserve this seat. 9 E None No Power Seat 9 E is designated by Scoot as a "SuperSeat." This seat is also is located in the "ScootinSilence" cabin, which is quieter than other areas on this aircraft. Scoot charges an extra fee to reserve this seat. 9 F None No Power Seat 9 F is designated by Scoot as a "SuperSeat." This seat is also is located in the "ScootinSilence" cabin, which is quieter than other areas on this aircraft. Scoot charges an extra fee to reserve this seat. 9 H None No Power Seat 9 H is designated by Scoot as a "SuperSeat." This seat is also is located in the "ScootinSilence" cabin, which is quieter than other areas on this aircraft. Scoot charges an extra fee to reserve this seat. 9 J None No Power Seat 9 J is designated by Scoot as a "SuperSeat." This seat is also is located in the "ScootinSilence" cabin, which is quieter than other areas on this aircraft. Scoot charges an extra fee to reserve this seat. 9 K None No Power Seat 9 K is designated by Scoot as a "SuperSeat." This seat is also is located in the "ScootinSilence" cabin, which is quieter than other areas on this aircraft. Scoot charges an extra fee to reserve this seat. This Scoot Airlines Boeing 787-900 is operated in a two class configuration of Business and Economy. Rows 6-10 are "ScootinSilence," a designated quiet zone. Passengers under the age of 12 are not permitted to book seats here. All "ScootinSilence" seats are either "S-t-r-e-t-c-h Seats" or "SuperSeats." Singapore to Coolangatta. One of the worst seats on the plane. Beginning of the rear section and got hit by every bag going past. Ended up standing up till everyone else was seated. Toilets are directly in front of you and you see everyone going in and out and they are all around you waiting to go in. Avoid if you can. The two seats beside me no better off. Seats are also narrow due to tray table in the armrest and everything stored above you for take off and landing. Staff very friendly. Scoot has ridiculous seating placement, by placing 3 oversize blokes in a seating row. Having absolutely rotten time for all the 8 hours (7and 1/2 hour flight + 1/2 hour delays) Switches on the seat hand rest is designed by an idiot, they are always get bumped at accidentally by almost every passengers. I will NOT fly Scoot again and will discourage everybody I know to fly with them. My family and I flew Scoot last year and it was the Dreamliner plane. We paid extra for extra leg room/wider seats and Scoot silence. My husband sat at seat 6C on way out and 6H on return. These seats were not only uncomfortable - narrow and hard but each time the flight attendants came through the doorway and aisle, he was brushed against so had to lean into the middle seat to avoid the trolley and anyone walking along the aisle. It was a very unpleasant flight for us going out and returning. We are travelling again to the same destination this year and will not be flying Scoot. We will go back to flying with Qantas as even their standard seats are so much more comfortable and make for a pleasant flight. Very uncomfortable seat on the new 787 Dreamliner. Leg rest was hopeless, leaving feet dangling in midair. Travelled Scootbiz 3 years ago and loved it. Now would avoid it like the plague. They also had no white wine at all on board. Very disappointed. SYD - SIN ScootBiz 1A & 1C, the best seats on the plane. The quietest flight I've ever had. Meals were ok, service was good, the plane was new and you could still smell the leather. The plane wasn't full up the front but it was glorious not to have to mind any other passengers. Will use again. SYD - SIN The quietest flight I've ever had. Meals were ok, service was good, the plane was new and you could still smell the leather. The plane wasn't full up the front but it was glorious not to have to mind any other passengers. Will use again. nanjing-singapore stand on tippytoes and arrive early when you check in, (it might make a difference) they usually pick tall people to sit at the emergency doors. 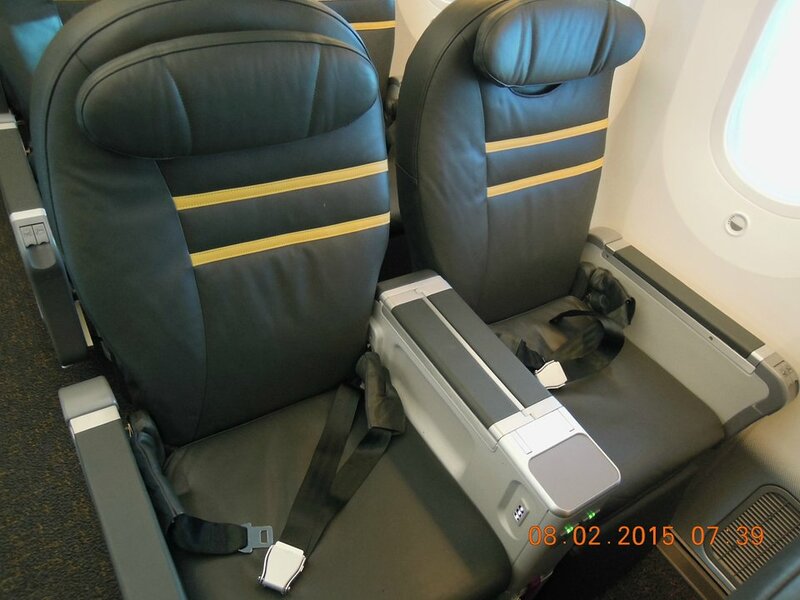 Flying Coolangatta to Singapore, very comfortable in second row of economy section, seatguru map calls this a premium seat, not sure if Scoot do tho. The seat pitch was 34-35inches, legroom was obviously plenty. The armrests are a slight concern, I lost count of the number of times I leant on the light or the Service Call button turning it on, hard to believe putting the switches on forward top section of the armrest was a good idea? The $15 hot meal and Sprite combo deal was Ok but only just. The meal portion is crazy small for the money. Still, the flight was a great deal overall, definitely flying again with Scoot. Good experience flying Scoot Biz. One meal with drink, seat power and entertainment is included in the price. Pleasant LCC experience. Food good, service cheerful and prompt. New 787 is clean, very quiet and I love the big windows that you can darken by degrees during flight. Be careful of the armrests, the crew call button and light are both located on there! Seat width and pitch are both good. The B789 cabin feels really spacious and the lighting is great. As expected with an airline like Scoot, they charge for everything. But the food pricing isn't completely unreasonable. This seat was satisfactory. The aircraft is new and looks clean. I have learned not to buy a seat before flight, as I have been assigned a better seat on check-in for nothing! As a LCC, anything above a seat and a seatbelt, you must pay for. The only drinking water available is tiny Evian 330ml bottles for 4SGD each. There is nowhere to fill your own bottles, so buy water in the airport before departure. 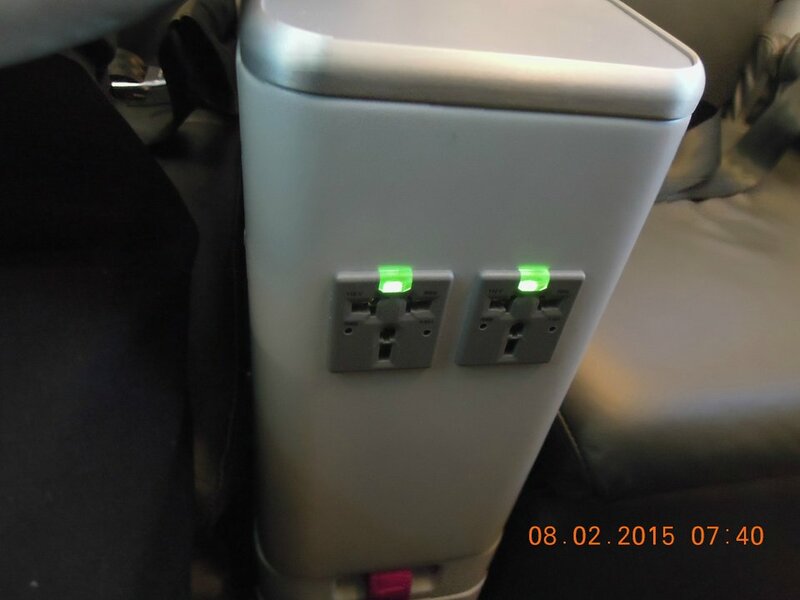 Seat power is apparently available in economy class, for a fee. 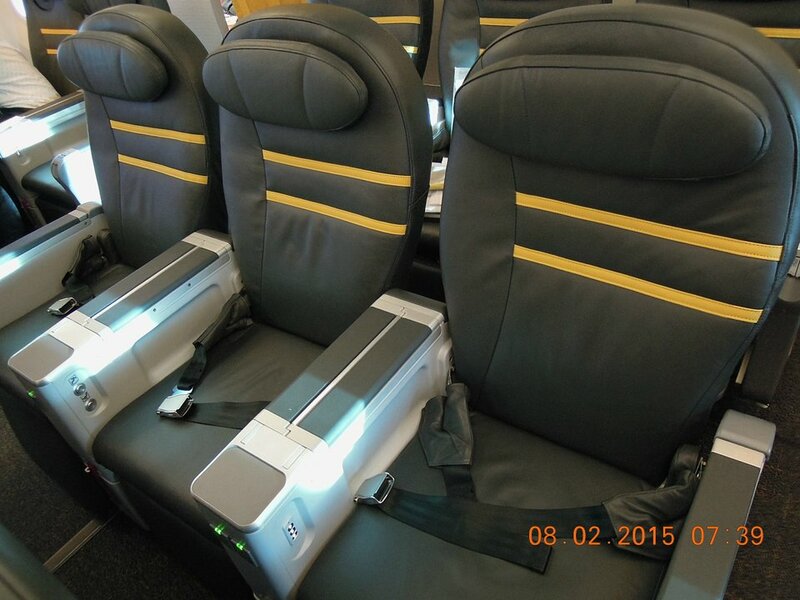 Scoot Airlines flies 1 versions of Boeing 787-900.